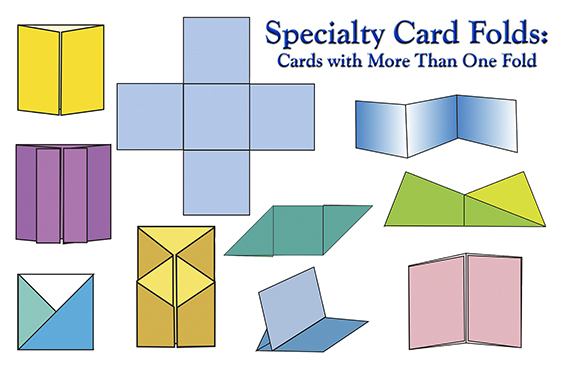 If you are a fan of my VSN eArticles, you have probably read “Specialty Card Folds: Cards With More Than One Fold.” My approach in the eArticle is to dig into how various cards are created so that you can take that knowledge and customize them to whatever size you like. In the eArticle, I also include charts with some example sizes to get you started. For example, the Easel Card chart in the eArticle provides measurements for 4” x 4”, 4 1/4” x 5 1/2”, 4 1/2” x 4 1/4”, 5” x 5” and 6” x 4” cards. Note: If you want your easel place cards sized smaller or larger, you’ll find instructions for how to do that in the eArticle. Obviously, you could alternatively use this idea with the names of your guests if you are sitting down to eat and want a name place card at each table setting. 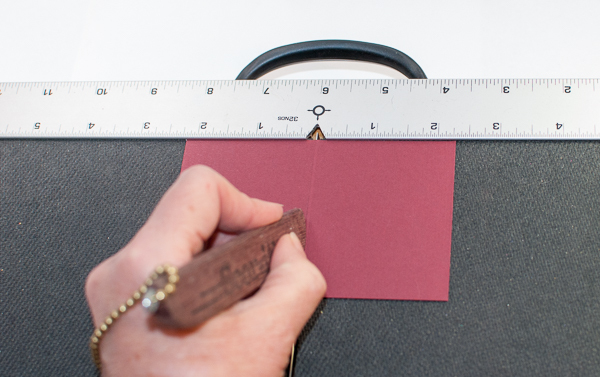 Depending on what you stamped on them, your guests might even take their own place card home as a small holiday card. 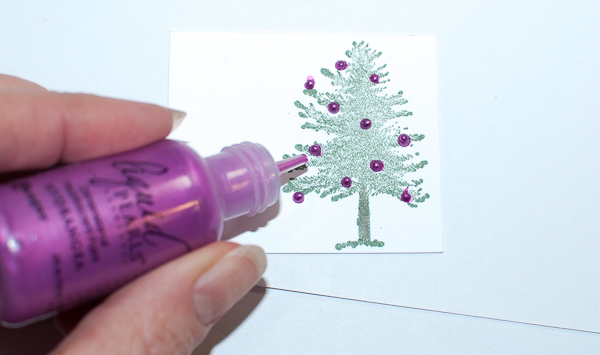 Because I will be making quite a few of these, I intentionally kept my artwork simple, using a basic stamped pine tree image (from Impression Obsession) embellished with little dots of Ranger’s Liquid Pearls to create “ornaments” on the tree. I stamped the tree in green and then colored the truck brown on top of the green using a colored pencil. 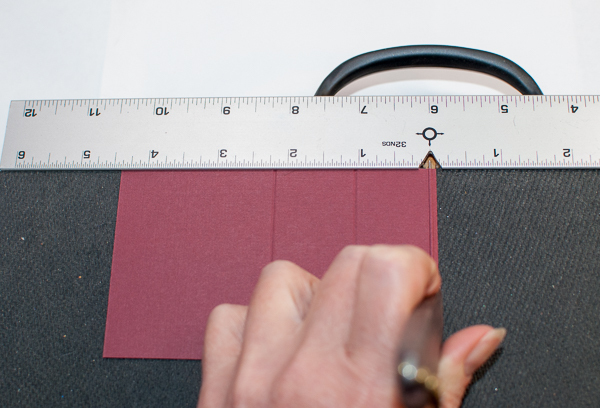 2) Trim 1/4” off the long edge of an 8 1/2” x 11” piece of cardstock, leaving an 8 1/4” x 11” piece. 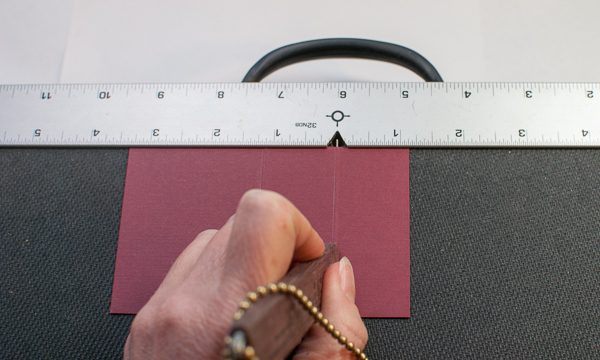 3) Trim 2” off the short edge of this piece to create a 8 1/4” x 9” piece. 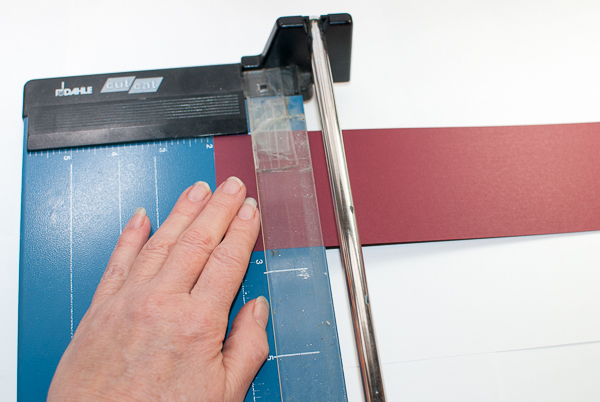 4) Slice the remaining 8 1/14” width of the cardstock into three 2 3/4” wide x 9” long strips. 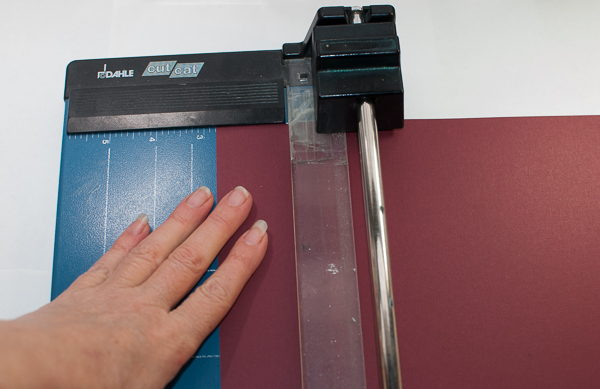 (So cut at 2 3/4” and 5 1/2” width marks down the length of the card. 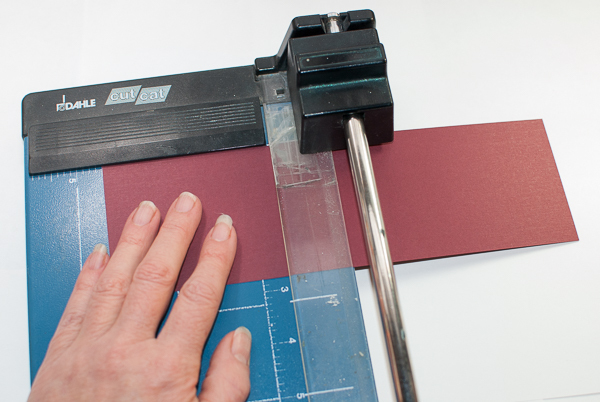 5) Cut each strip in half at the 4 1/2” mark to form six 2 3/4” x 4 1/2” pieces. These are your easel bases. 6) Valley fold each base in half at the 2 1/4” mark. 7) Valley fold one section of each base in half again at the 1 1/8” mark. 8) Optional: With cards this small, I sometimes find that the front panel is a little too light-weight to stay in place behind the brad. So in this case, I’ll do one more fold, this time a mountain fold right at the very end of the smallest section, maybe 1/16” in from the short edge. This creates just the tiniest lip that can be tucked underneath the brad to hold it in place just a little better. 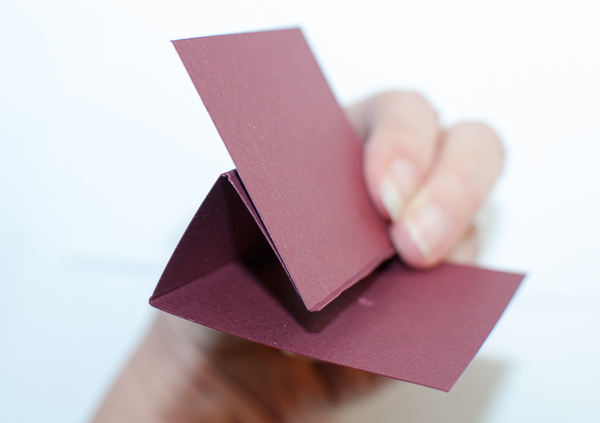 Experiment with this on a sample of your place card to see if you find it helpful. 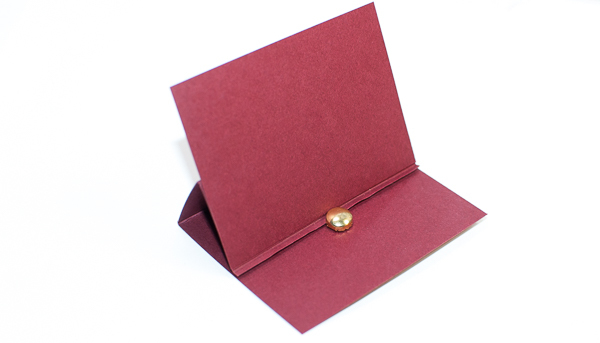 10) Place a brad on the card base to hold the card front section in place while standing. 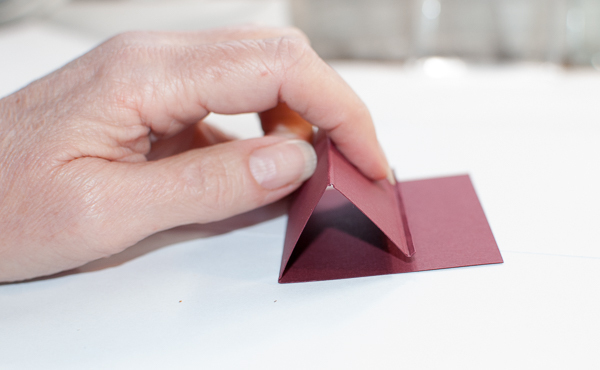 Optional: To allow the easel portion to be re-used with different card fronts in the future, attach the fronts with double-sided removable tape instead of a permanent version. Or, alternatively, you might permanently attach the fronts, but use removable tape to attach a separate text layer, allowing you to re-use the decorated place cards with different text next year. Because the easels fold flat, you can very easily store them for future use. Try this and see what you think. I’d love to hear about how you use this idea, so please do leave a comment. Here is a hand-written version of the same place card. I liked the computer generated text version below better even though it adds a layer. ← Sponge & Brush Techniques For Stampers eArticle Updated! Beautiful design and colors.And I love how you decorated the tree. 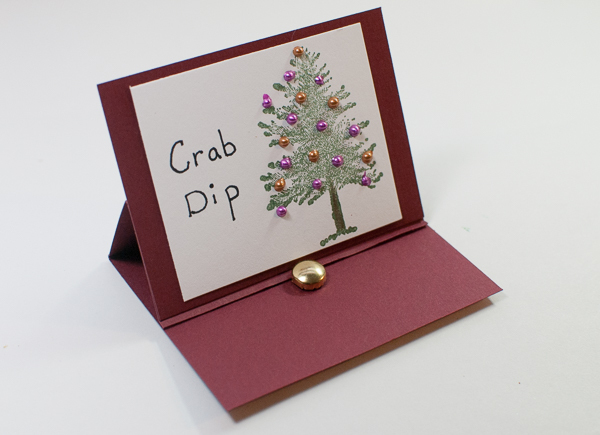 When I first saw the photo and it said Crab Dip I was wondering who was the person getting that card. LOL Glad I read the whole blog post now. 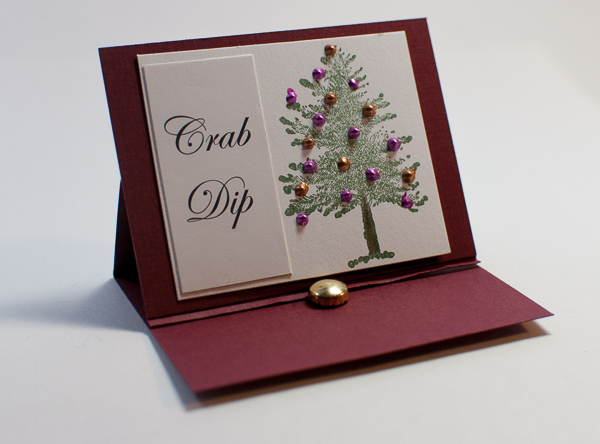 Easel cards are so fun and I can see mini ones working for name cards perfectly. LOL. If they were for an individual table setting, then that place card would get me coal in my stocking wouldn’t it? Great article with a great idea !!! Don’t see how you found time to write it during this busy season….but it is really perfect timing for the holidays. Think I may use the idea for an upcoming neighborhood party… Thank you for all your inspiration and all your help !! Strange….I was just thinking about you a couple of days ago…and then your article showed up….hee hee Have a wonderful and joyous Holiday Season !!! LOL. I had this blog post in my head and had to get it out of there so I could concentrate on everything else the holidays require! I hope your holiday party goes really well! Thank you so much Nancie..I live this post.Happy holidays to you. You are quite welcome. Hope it is helpful. Have a wonderful holiday!